If you need to make a festive bake for a Christmas treat, a special “North Pole tea” for the kids or a Christmas bake sale then I have got you covered. 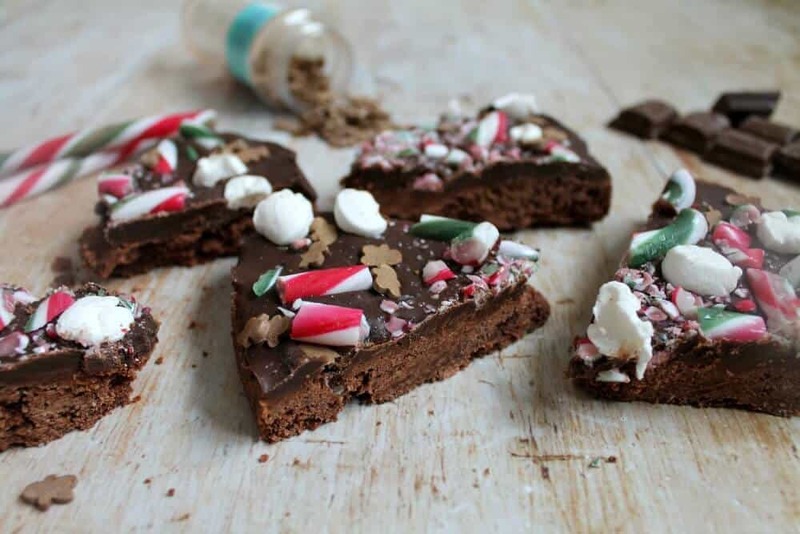 My Christmas chocolate shortbread is a delicious layer of buttery and crumbly chocolate shortbread topped with a thick layer of chocolate and decorated with crushed candy canes, marshmallows and gingerbread man sprinkles. Easy to make, quick to bake and even easier to eat! 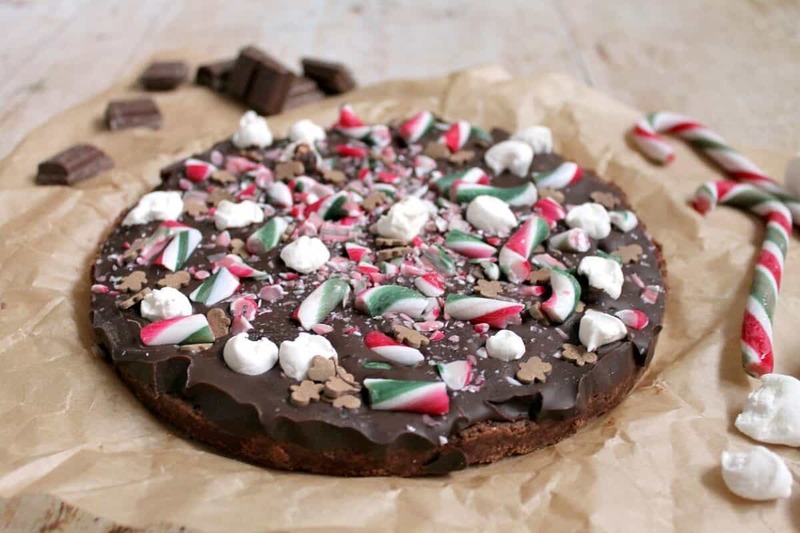 If you are like my kids then you would want a slice of this every day in the run up to Christmas, although that won’t actually be happening clearly. As a special festive treat this is just right though and great to share with friends. Serve it up with with a hot chocolate (my thick and creamy slow cooker hot chocolate would be ideal) with whipped cream, marshmallows and candy canes for the ultimate Christmas treat! 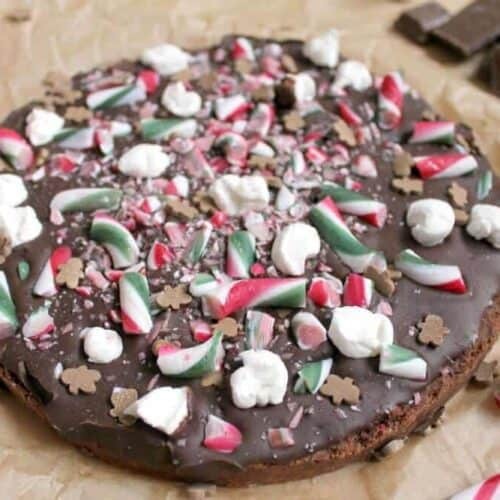 It couldn’t be easier, the shortbread only take about 20 minutes to bake then once it has cooled cover it in melted chocolate and decorate with crushed candy canes, mini marshmallows and gingerbread man sprinkles. 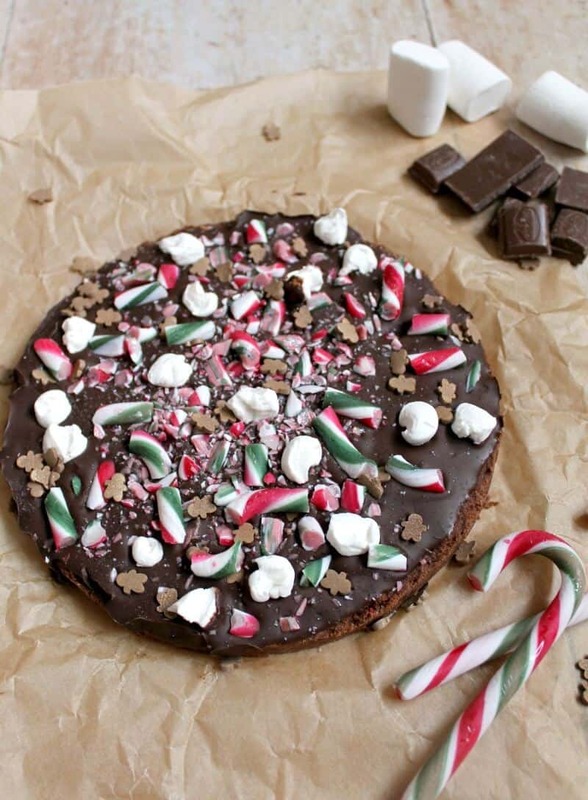 Kids will love to help decorate this almost as much as they like to eat it. We found these candy canes (as well as the marshmallows) in the pound store, the red and green stripes make the shortbread look extra Christmassy we thought. 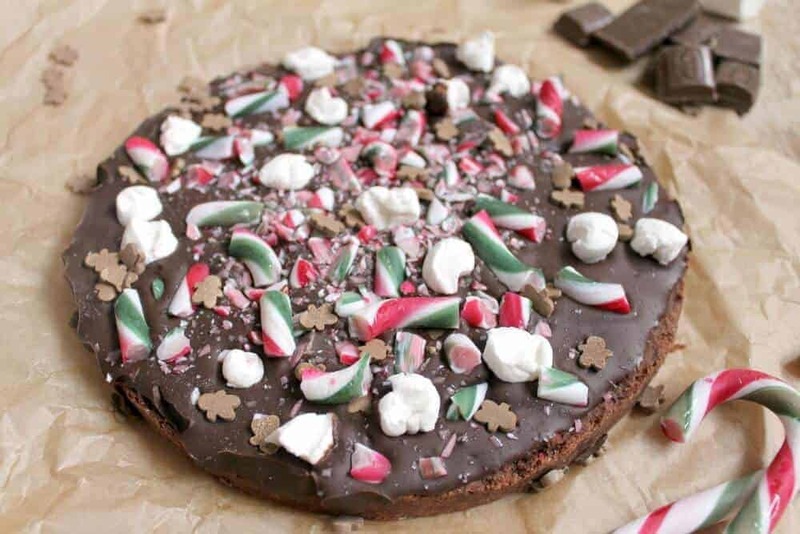 You can get all kind of festive items in the pound shops right now which makes Christmas baking a lot cheaper, I think it is a lovely way to have fun with kids. If you are baking for a Christmas bake sale for work or school to raise money for a charity or good cause, one large shortbread will make 6-8 slices which you can wrap in festive cellophane and tie up with red and white string to make it look extra special. I am sure candy canes weren’t really a festive treat in the UK when I was a child, they seem to be an import from the States. I do like their peppermint flavour though and they add a nice crunch to bakes. 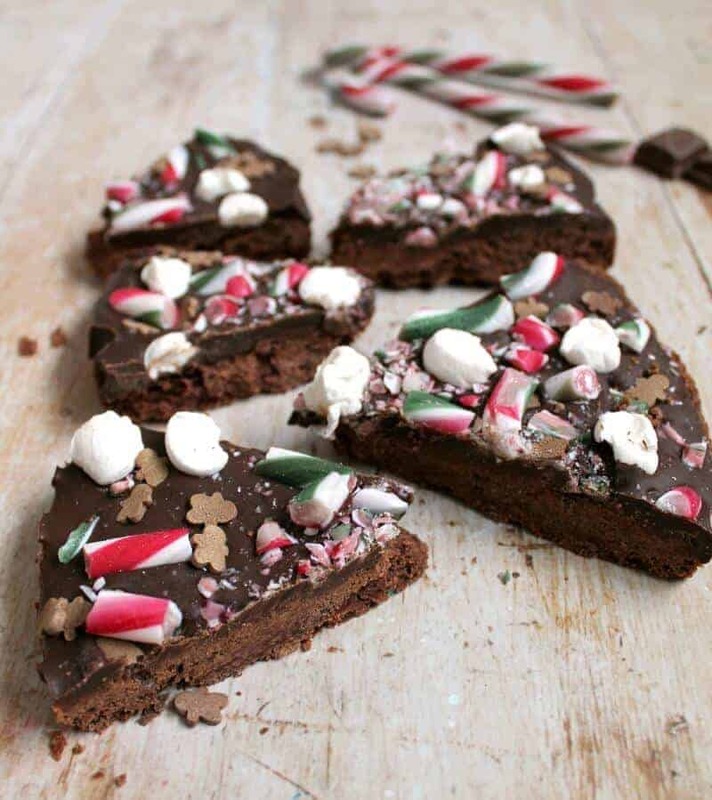 I’ve also got a recipe for slow cooker candy cane fudge which you might like. Make the shortbread. Cream the butter and sugar together until very soft. Add the flour and cocoa powder, stir with a spoon at first and then bring the dough together with your hands. Grease a 7 inch cake tin with butter and heat the oven to 180 degrees. Press the dough into the tin, flatten and prick with a fork. Bake for 15-20 minutes. It will harden as it cools, don’t worry if it still feels soft. Allow to cool then remove from the tin (use a knife around the edge of the tin then turn over carefully and remove the shortbread onto your hands). Melt the chocolate in the microwave in a bowl. Spread onto the shortbread. 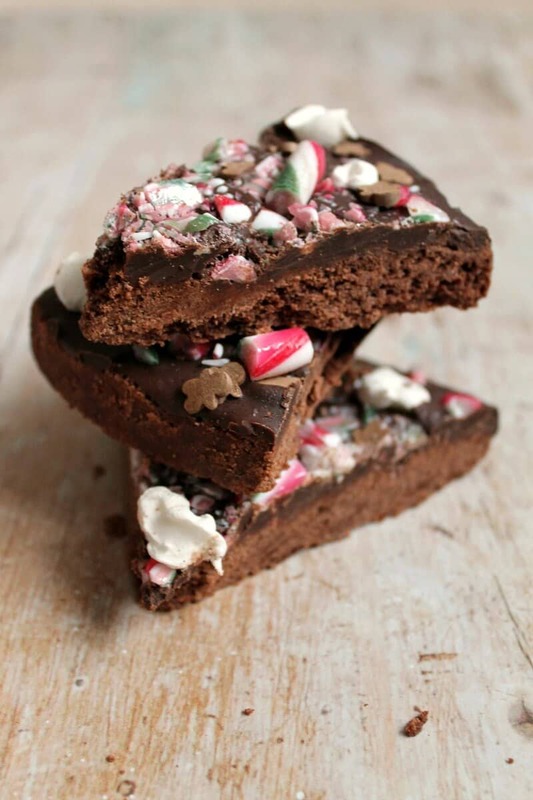 Crush the candy canes and sprinkle over the chocolate with the marshmallows and gingerbread man sprinkles. Chill in the fridge until set. Slice and serve! The recipe time does not include the time for cooling the shortbread and setting in the fridge. Ooh, love this Lucy. Shortbread is an essential at Christmas and your chocolate shortbread looks truly outrageous and perfect for the festivities. I hope you and the family all had a good time. Thanks for sharing with #WeShouldCocoa and I wish you the very best for 2018. Thanks Jenny, I’ll link up over the weekend!